Qualified opportunity zones have captured the attention of professional investors since passage of the Trump tax cuts in late 2017. The industry has thus far favored institutions and high net worth individuals. Retail investors have much less access, but they can still find opportunity zone investments in several ways. A sign displayed on Bruckner Building reads 'Commercial Space Available' in the Port Morris neighborhood of the Bronx borough of New York. For a limited time, investors who develop real estate or fund businesses in opportunity zones are able to defer capital gains on profits earned elsewhere and completely eliminate them on new investments in 8,700 low-income census tracts. By investing in underserved rural and urban communities called "opportunity zones," investors can defer or even avoid capital gains taxes on asset sales. These risk zones represent a potential windfall for investors. The Economic Innovation Group, a policy group that played a key role in developing the concept, estimates more than $6 trillion of potential capital gains are eligible for the program. But the program has been mostly dominated by institutional investors and high net worth individuals. Some 8,700 areas in all 50 states and the US territories have been designated qualified opportunity zones. "The opportunity zone tax code is really built for the mega wealthy and the institutions and doesn't really benefit the retail investors from a tax basis," said Michael Weisz, co-founder and president of the investing website YieldStreet. Now, some real estate and tech investment sites are trying to lower the barriers to entry so non-accredited investors can also get in on the action. Anthony Scaramucci's hedge fund SkyBridge Capital and its partner Westport Capital, for example, are looking to raise $3 billion to launch an opportunity zone real estate investment trust. But SkyBridge only takes on accredited investors, individuals with a net worth of at least $1 million (not including your home) or those with an income of at least $300,000 in the past two years. SkyBridge's President Brett Messing told CNBC that the average investment in the trust is about half a million dollars. Firms like Belpointe, on the other hand, are trying to open the market up so retail investors can get in on the action. Belpointe launched a real estate investment trust called "The Opportunity Zone REIT," the first to be registered with the Securities and Exchange Commission. The Belpointe REIT is open to non-accredited and accredited investors with a minimum investment amount of $10,000, according to the company's release. "We're trying to offer a product that allows all types of investors, retail and institutional, in the same way any pension fund or endowment would invest in real estate," said Brandon Lacoff, CEO of Belpointe. It also claims low-cost status with no upfront commissions, an annual management fee of 0.75 percent and a carried interest fee of 5 percent. Belpointe has about 20 opportunity zone properties in the pipeline. Online real estate investment platform Fundrise has made two multi-asset opportunity zone investments with a third under contract. The minimum investment is $25,000 with management fees below 2 percent. Co-founder and CEO Ben Miller said Fundrise has more than half a billion dollars in real estate across the country and uses its deal flow to find sound investments. "Opportunity zones let you find something in the rough and polish it and have it grow into something," said Miller. But some in the real estate and investing communities view opportunity zones as more risk than reward and are staying away until there's greater clarity from regulators. Real estate fundraising start-up ArborCrowd, for example, is not offering customers any opportunity zone projects due to a lack of transparency about the regulations. "There are more questions than there are answers," said co-founder Adam Kaufman. Investors are waiting on a new list of tax regulations from the Treasury Department that will establish the most comprehensive opportunity zone guidelines to date. The regulations are expected in the coming weeks. 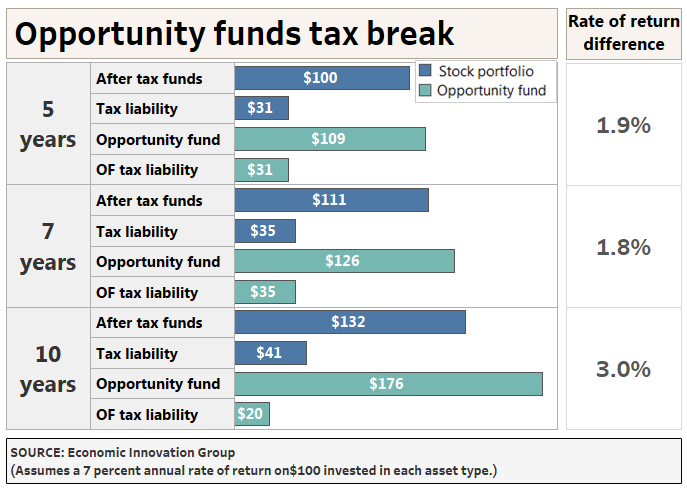 Investing website YieldStreet does offer investments in opportunity zones, but only through the debt market which makes them ineligible for the tax benefits. The firm has singular and multi-asset funds with a minimum investment of $10,000 and a 1 percent fee. President Michael Weisz said the investment opportunities sold out 30 seconds after opening. The Bronx Tavern stands in the Port Morris neighborhood of the Bronx borough of New York, one of the 8,700 low-income census tracts. The goal is to reinvigorate these areas. Though there's clearly a demand, Weisz cautioned that the opportunity zone movement has encouraged people to invest heavily in concentrated locations and they will all be trying to exit those positions at the same time. "The executions and liquidity risks are high," he said. CrowdStreet, a real estate investment platform, has offered two single-asset opportunity zone investments on its platform to date, a hotel redevelopment in Redman, Oregon and a flex-industrial space in Arlington, Washington. The minimum investment is $25,000 with a 1 percent acquisition fee and asset management fee of 2 percent of income. Vice President of Investment Ian Formigle believes investors can save 50 cents on the dollar in taxes by putting their capital gains in opportunity zones. But he also gave a word of caution about such investments: "It can't make a bad deal good, it can make a good deal better," he said.